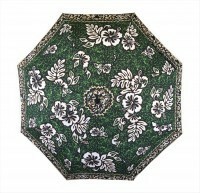 Come in from the rain with this fun umbrella! Features a Hawaiian print with petroglyphs, sea turtles, tats, and flowers in green, tan, black, and white! Umbrella perfect for one person to stay dry and comes with a nylon sheath to keep it safe when not in use. 116" around. Note: Product brand new and only removed from plastic for photography purposes.